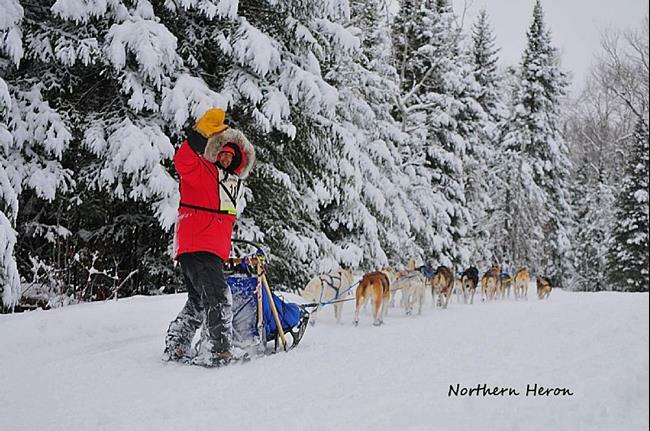 The John Beargrease Sled Dog Marathon is touted as "the toughest race in the lower 48". It is often talked about as a more difficult race to run as the far northern Minnesota evergreen laden terrain is so hilly that only the heartiest of mushers makes it to the almost 400 mile finish line. Hearty Alaskans who have been finishers of Iditarod come to Minnesota to run this race, and many drop out, it is just too tough on their dogs, who are not used to our hilly terrain. The night before the 2013 running of Beargrease, it snowed like the dickens, which made for some beautifully covered evergreens everywhere along the trail. This year was probably the most beautiful as far as the snow cover on the trees. In this image is Frank Moe, a musher from Grand Marais Minnesota near the Canadian Border, as he passed by he greeted us and left with a wave as he disappeared over the hill into the evergreen lined trail to the north.